This is the last of four articles in the fruits and vegetables series. Previously, I looked at picking the right fruits and vegetables, examined how pesticides affect produce, and why frozen fruits and vegetables are better than canned. One reason why frozen comes out the winner is that canned food contains Bisphenol A or BPA, which is a major concern when eating canned fruits and vegetables. BPA is an industrial compound that has been shown to be toxic even at low doses. It is an endocrine disruptor, which means that it acts as a hormone in the body, taking up space in receptor sites and leaving excess hormones to flow through the body and cause damage. BPA has been tied to numerous health concerns including breast and prostate cancer, infertility, cardiovascular disease, Type 2 diabetes and liver-enzyme abnormalities. BPA is ubiquitous as it is found in so many places including water bottles, cans, air, dust, office water coolers, printer inks and toners and thermal receipt paper used by grocery stores and gas stations (which can rub off onto the hands and then be absorbed by skin or ingested after contact with the mouth). The CDC found BPA present in the urine in 93% of the U.S. population and the Environmental Working Group found BPA present in the cord blood of newborns. Avoiding BPA is a positive step toward improving wellness, and while some exposure may be hard to avoid, avoiding canned products can prevent one big source of exposure. Virtually all cans, including those containing fruits and vegetables, soda, soup, baked beans, spaghetti and ravioli and even infant formula, are lined with BPAs. 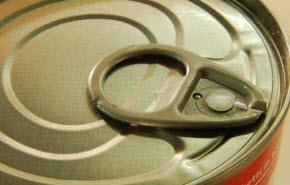 Most tin cans have an epoxy liner made from BPAs (ironically to prevent the interaction of the food with the metal in the can). It’s estimated by the FDA that 17 % of the American diet comes from canned foods (and that doesn’t account for all the canned foods served at restaurants), so this is a big area where we reduce can our exposure to BPAs. The National Workgroup for Safe Markets recently released a report titled No Silver Lining that tested a random sampling of 50 cans from across the U.S. and Canada, looking at typical products many Americans might eat on a daily basis. BPA was found in 46 of the 50 products. The highest level ever found in the U.S. was found in a can of DelMonte French Style Green Beans, with a level of 1,140 parts per billion or ppb. Walmart’s store brand (Great Value) of Sweet Peas came in at 329.3 ppb. Healthy Choice Old Fashioned Chicken Soup had 323.6 ppb. Healthy Choice Chicken with Rice Soup had 172.4 ppb. Campbell’s Cream of Mushroom Soup had 130.4 ppb and Campbell’s Chicken Noodle Soup had 127.5 ppb. The amounts varied by can even among the same product offering, perhaps reflecting the time the product remained in the can. While again there are no specific acceptable levels of BPAs, the study found that consumption of even one can of food might yield more BPA levels than were shown to cause health effects on developing fetuses in laboratory animals. Unfortunately, there are no viable alternatives that work across all food products, which poses a manufacturing challenge that has made the industry reluctant to change. Eden Organic is the only company using a BPA-free lining for canned foods that I know of; they bake an oil and plant-based resin onto the cans instead. Muir Glen, another organic company, hopes to be BPA-free within the next year or so. There is one premier fish product, Henry and Lisa’s Natural Seafood (Sashimi-Grade Canned Albacore Tuna) that is also BPA free. But no company has been able to offer BPA-free canned tomatoes due to the acidity of the tomatoes and their tendency to leach more from the metal of the can. Glass may be an option for pre-made sauces, but keep in mind that manufacturers may purchase canned tomatoes as a base ingredient for the sauce, so they may still contain BPAs from their original content sources. For those of you who use canned tomatoes, there are options other than using fresh tomatoes. Pomi tomatoes, distributed by Boschi Food and Beverage of Italy, offers tomatoes in BPA-free containers. Their chopped and strained tomatoes are available on Amazon. And Trader Joe’s offers tomatoes in cartons that are also BPA-free. Short of preserving them yourself, those are the best options. Sadly, in all but five states (Maryland, Connecticut, Wisconsin, Minnesota and Washington) baby and infant products are still sold in BPA-laden cans. Given babies’ size and developing systems, that seems criminal to me. We should all try to avoid BPAs and proactively work to minimize our exposure: Avoiding food in non-BPA-free cans is a great first step. But it’s an effort that is even more important for pregnant women and young children. One final word before we end this series on fruits and vegetables: Don’t let the cautions we’ve discussed prevent you from eating more fruits and vegetables. Try to get up to 13 servings a day. Fresh, local and organic is always best, but do the best you can. Definitely choose organic for the “dirty dozen,” even if it means opting for frozen. Buy local mixed with frozen for the rest, with as much organic as your wallet and lifestyle will allow.